From the bands you need to see to the theme nights, here's the lowdown on the best festival to ever hit the high seas. 1. Who is on the 2018 Parahoy lineup? 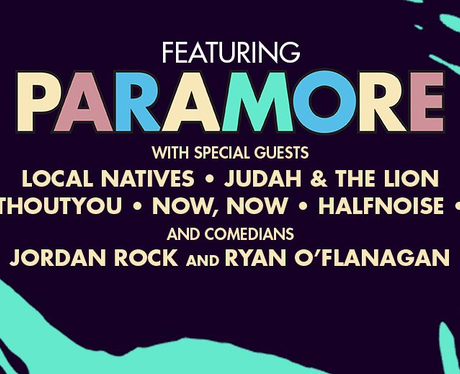 Local Natives, Judah & The Lion, MEWITHOUTYOU, Now,Now, Halfnoise and Mija will perform alongside Paramore on the musical lineup. Comedians Jordan Rock and Ryan O'Flanagan will also be on hand. 2. What are the dates of Parahoy 2018? The cruise will take place between the 6th and 10th of April, embarking from Miami to Nassau in the Bahamas. The perfect vacation basically. 3. What activities can you do at Parahoy? In addition to all the live music fun, there will be a Paraoke session (karaoke, obvs), a belly flop contest into the pool judged by the band, a ping pong tournament culminating in a final against Taylor and Zac and a full Q&A session with the band. 4. What is name of the ship used for Parahoy? Parahoy guests will set sail on the Norwegian Jade, a HUGE ship which features multiple bars and restaurants, a casino, theater, spa and nightclub. 5. What are the 2018 theme nights for Parahoy? Pack your best fancy dress because the cruise will feature four nights of themed fun. This year's themes are 'Check It Out', 'Vintage Night', 'Life In Technicolor' and, best of all, 'Halloween'.